Gray, Harold. 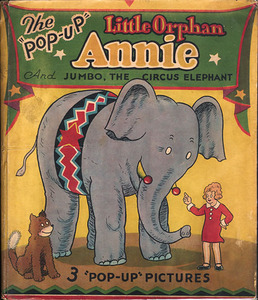 The "Pop-Up" Little Orphan Annie and Jumbo, the Circus Elephant. Chicago: Pleasure Books, 1935. This small format Blue Ribbon has only three pop-ups and therefore lower production costs. The circus setting creates the perfect arena for Annie, the popular Depression-era orphan, to steal the show. Lentz, Harold B., illus. 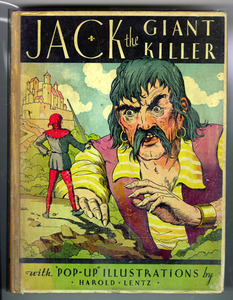 Jack the Giant Killer and Other Tales. New York: Blue Ribbon, 1932. This book's endpapers show us "A Map of Giant Land," apparently located close to Cornwall on the British coast. From here, the book invites us to join Jack in his adventures with the giant. Lentz capitalizes on the discrepancy in size--a boy facing down a monster, even if Jack's horse out-sizes the giant. Lentz, Harold B., illus. 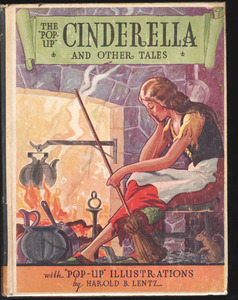 The "Pop-Up" Cinderella and Other Tales. New York: Blue Ribbon, 1933. The green hypnotic cat eyes, the sharp teeth, the claws, and the club all give the mouse plenty of reason to leap in fear in this impressive pop-up from "Puss in Boots." Lentz has the cat towering over its prey and even the book itself. Lentz, Harold B., illus. 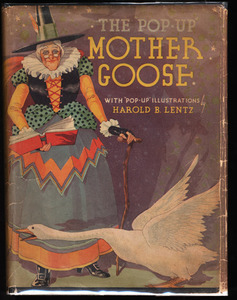 The "Pop-Up" Mother Goose. New York: Blue Ribbon, 1933. Pop-up novelty effects work well with the simple rhymes of Mother Goose. Lentz revitalizes the familiar lines, "Old Mother Goose, when she wanted to wander/ Would ride through the air on a very fine gander" as we turn the page and suddenly see the large white bird outlined against the night sky. Collodi, Carlo. 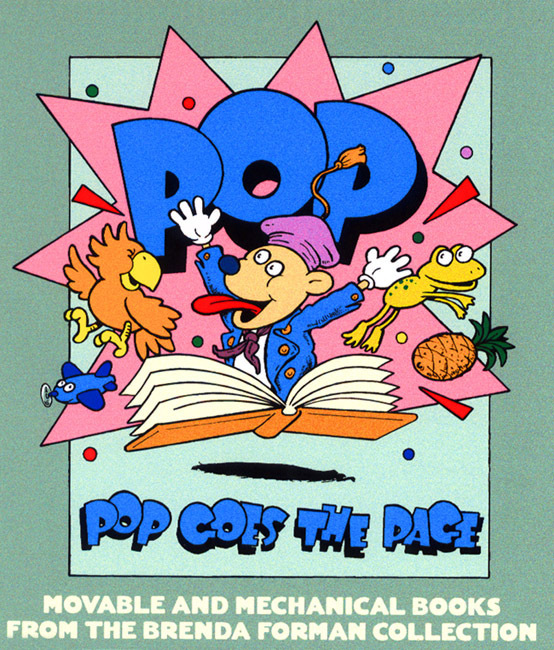 The "Pop-Up" Pinocchio: Being the Life and Adventures of a Wooden Puppet Who Finally Became a Real Boy. Illus. Harold B. Lentz. New York: Blue Ribbon, 1932. 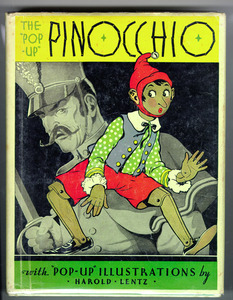 Lentz's illustrations focus on the grotesque and comic features of this long-nosed wooden doll, while simultaneously making sympathetic Pinocchio's travails. In this scene, the illustrator cleverly creates a bird's-eye perspective, placing us above the giant fish by drawing to scale a nearby seagull in mid-flight.